I've watched Ruger LC9s come across the counter and watch them leave as rapidly as they showed up. It didn’t seem to matter which model, the plain version, ones with Crimson Trace Lasers, and others with LaserMax came in and left quickly. I've carried a gun with a permit for about 8 years and have been an instructor for a few more than that. I recently picked up a Ruger LC9 and wondered why? Ruger already makes an SR9 Compact model. That gun seems to sell well, and comes in at about 23 oz. It supposedly competes with the subcompact Glocks for those people on a budget. As quickly as the SR9s come in, they go out. 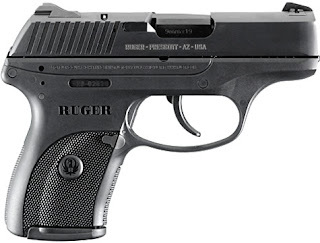 Ruger has done a good job of offering reliable, feature-rich guns at affordable prices. If the SR series competes with Glock, who does the LC9 compete with? Could it be that Ruger intends to steel business from the Kimber Solo? The Kimber Solo has received good write ups, but Kimber has been slow to ship these guns. Looking at the features I have to say this makes more sense than the LC9 competing with the Glock subcompacts. The Solo and the LC9 weigh in at 17 Oz., both come in 9mm, both are DAO, and both have a small thumb safety. The solo offers a 6 round magazine and the Ruger a 7. The Ruger can be had for almost half the cost of the Solo. The LC 9 comes in a nondescript box, one 7 round magazine, key (that is also used for take down), and a nylon carry case and owner's manual. The model I used is the plain version without laser. The gun weighs in at 17.10 Oz. according to the web site. Retail pricing comes in at $443 but at the gun shops, $335-$350 is common. I’m not going to tell you this is the be all and end all gun. I've not had it long enough, or put enough rounds through it to make that determination. The gun has cycled through 1 box of Federal 115 grain target ammo and 10 rounds of 124 grain Federal Hydra-Shok JHP. The gun ate all rounds with no failures to feed, eject or fire. It was 100% on function. The gun was a surprise to shoot. 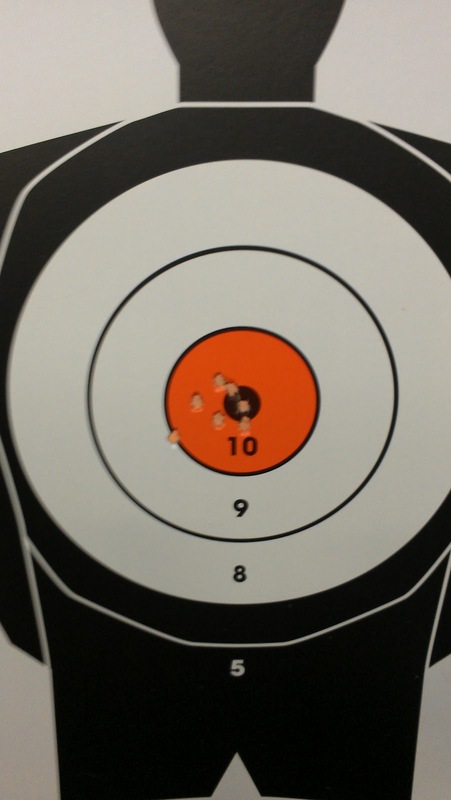 I was expecting it have nasty recoil, similar to the LCP, but no, recoil was mild to moderate. The dual springs dampened recoil to a very manageable level as long as the shooter maintains a good grip on the gun. The glass nylon frame is rugged, light weight, and well checkered for control. 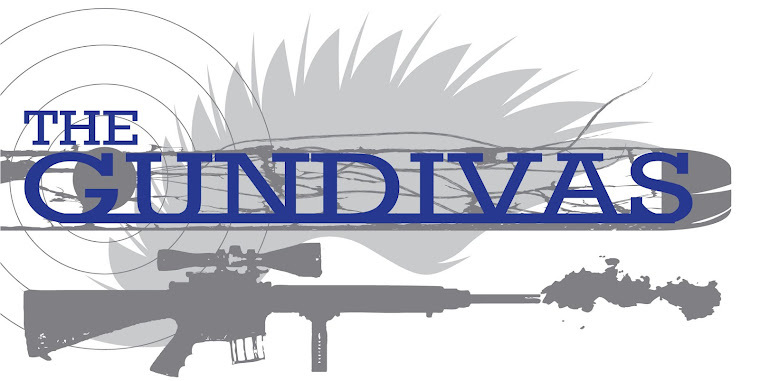 It’s a close range gun and shot accurately at close ranges. 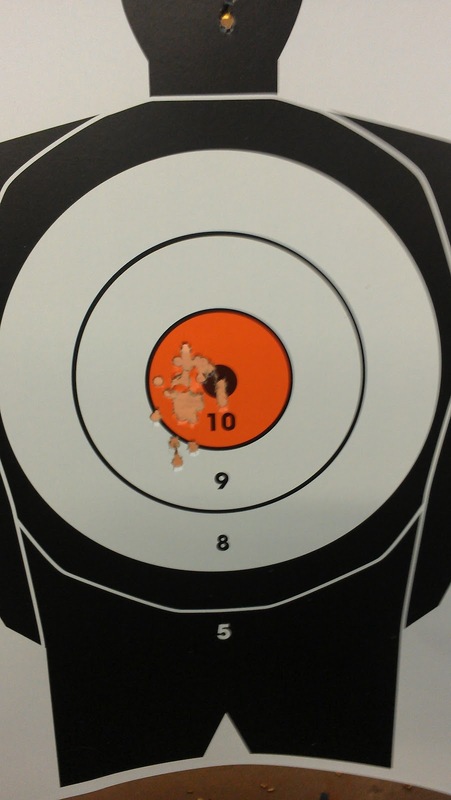 The target below was the first magazine through the gun at 25 feet. 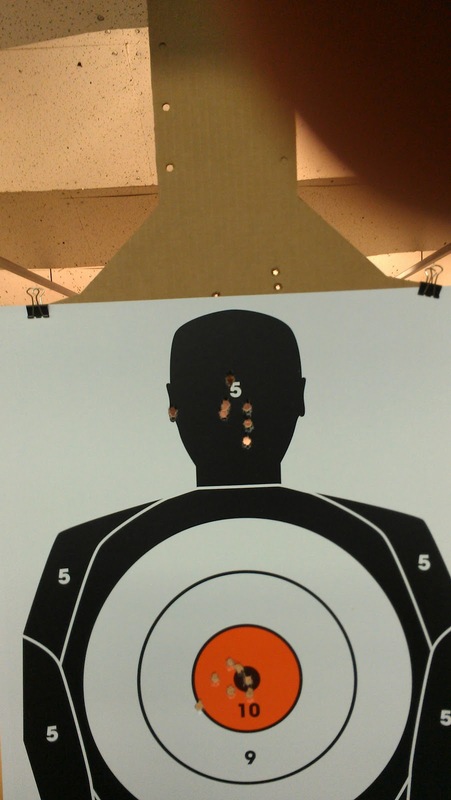 The second image (head shots) was the 2nd string of fire on the target. The last target image is the balance of the 60 rounds spent on this target. Last positive notes, the top of the slide comes with a big, tactile, loaded chamber indicator, the magazine comes with a base plate you can get your pinky on, dove tail sight mounts, and a big trigger guard that gloved hands can utilize, round out positive features. The sights are of the 3 dot variety and Ruger does not have a traditional night sight offering. However, I’m aware of no night sights offered on a $350 gun. I've seen some instances of the LaserMax version being offered in this price arena, and probably explains why Ruger doesn't offer a traditional night sights. The trigger pull is long The trigger is not so bad that a bit of dry fire practice can’t overcome, and the trigger is consistent for each pull. The reset has a 2 “snap” tactile/audible feature that does a good job of telling you the trigger is ready. Some of you will find it tolerable and some won’t. As far as DAO triggers go, it’s not bad. I've certainly seen worse triggers on more expensive guns, but as you would expect from a 1911 guy, the trigger is long. The take down is a bit wonky. The logic is familiar, but the practice is cumbersome. There is a small window which must be slid down into the frame, then a small punch, or provided key, is used to push the pin from the other side of the frame through the open window. It seems like a more traditional 1911 style slide stop pin, or Beretta or Sig style rotating pin would have filled the bill and not impacted the appearance or function of the gun. The provided key acts as a punch for all the pins and used to unlock the gun if you were to use the in frame lock (not function tested). No Ambi controls. Thumb safety and mag release are on one side only, however, if I were a southpaw, I’d just dispense on using the thumb safety, the trigger pull is long enough. I do not like magazine disconnects, I don’t get it, is this feature that you want? The magazines are a bit more expensive than I would have thought for a metal single stack 7 round magazines at $35. A magazine that looks like it is a common 1911 9mm magazine. The factory magazine is labeled “made in USA”, but the second mag, purchased in Ruger packaging is labeled “Made in Italy”. I’m guessing made by Mecgar for Ruger. Both flush fitting and extended base pads are included. 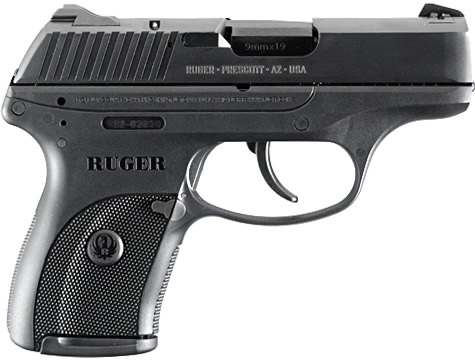 The Ruger LC9 is a budget minded subcompact, 7 + 1 single stack, DAO only, 9mm semi-automatic handgun. I’ve always carried a mid sized 1911 for CC applications and that’s not going to change for me. However, as a BUG or CCW for women, or others that need a small frame gun, this gun fits a nice price point and is out of the box reliable. Good ergonomics, allow you to point the gun quickly and accurate at close ranges. If you consider this is a 9mm that recoils more lightly than similar sized 38s and 380s I think the gun has a great future in CCW applications. I’m not telling you this is the be all and end all of subcompact guns, but if you’re looking at a Glock 26, or Kimber Solo then this gun should be evaluated as well, and measured on its own merits to help you make an informed decision. Big Note, I've barely put a box of ammunition through this gun, only time and more rounds down range will determine if this gun really is up to the task of defending your person. Ruger has a good reputation and has been engineering more desirable guns in the last few years. The gun shoots accurately at defensive distances and has features that CCW applicants look for. The purpose of this review is to give you a look at a new gun on the market and give you initial thoughts. If after 250 rounds this gun continues to shoot well and function error free I would consider carrying it or would suggest my wife evaluate it as her CCW gun. I know many people aka women look for that, but it still kind of gets me. As a BUG though, very appealing. Oh, I see what you are saying, yes that was kind of clumsy, and I'll avoid that in the future. I didn't mean as any kind of slight towards the abilities of women. No, no, I was totally just giving you a hard time. Not everyone thinks I'm funny. Sorry! I have one, and love it. It makes a great back up to my Glock 19, and for the rare occassion when I really do have to have something lower profile, it fits nicely into a thigh band without being so heavy that it won't stay in place. 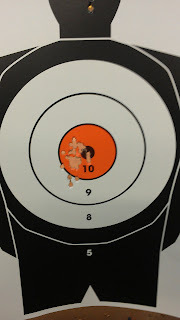 The recoil was a nice surprise, not bad for a smallish gun, I liked it so well I sold my LCP. Bottom line, I'm not sure I would keep it as a primary, but I love it as a secondary, easy to handle, accurate, add the pink tip extension to the mag and it is quite comfortable to handle. Good review! I bought the last Ruger LC9 at my local gun shop yesterday. It was also the last compact 9mm they had in any brand. The manager said that in the last week their business had tripled. I had been practicing with a full size Glock 9mm at the range, but decided for the home and car I wanted something smaller. 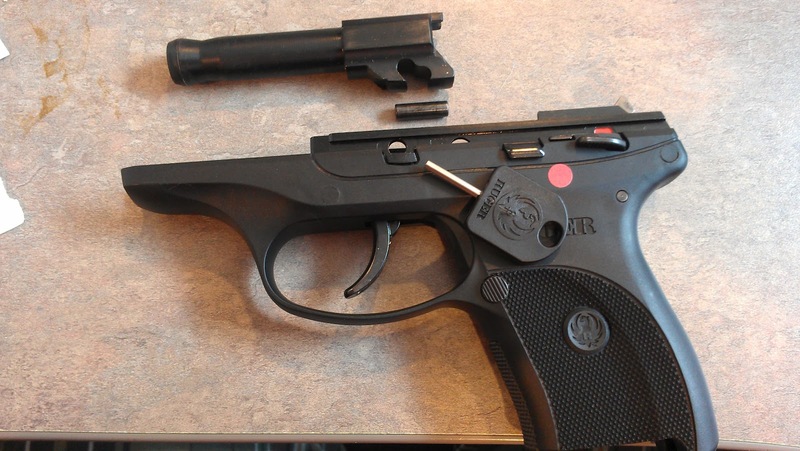 The Ruger LC9 appealed to me because of the cost and accuracy at close range. Thanks for creating this website! I have recently purchased the gun and absolutely love it. The mag disconnect at first was a mystery to me but I can see two logical reasons why they have added it. One, it's for people who have no or poor knowledge of gun etiquette. Two, what if the attackers happen to gain control of your gun? In the midst of the attacker trying to take your gun, the owner knowing the gun so well could potentially extract the mag and the attacker would not be able to operate it anymore. That is the only beneficial thing I can think of. I plan on removed the disconnect feature soon. I have done a lot of research on this weapon as I intend to purchase one. It was love at first grasp! Iam very new, and just completed my cpl class. In all of my research, this is only the second time I bave heard of the mag disconnect... what is that? Should I be concerned since this will be the first weapon that I will own/carry? Any info is much appappreciated! The mag disconnect is a "safety" feature required by the Republic of California that does not allow a gun to be fired if the magazine is not seated in the mag well. That way, if there is still a round in the chamber, but you take the mag out, the gun shouldn't go "bang". It's really, in my opinion, a matter of what you like or don't like. There are tons of opinions on both sides. I guess I don't care one way or another if my gun has a mag disconnect, but most of the shooters I know remove theirs (if possible). Oh, and I tried to email you directly, but your email isn't linked to your profile. So a man should not buy this. dan ny - there is no reason for a man not to purchase this gun. 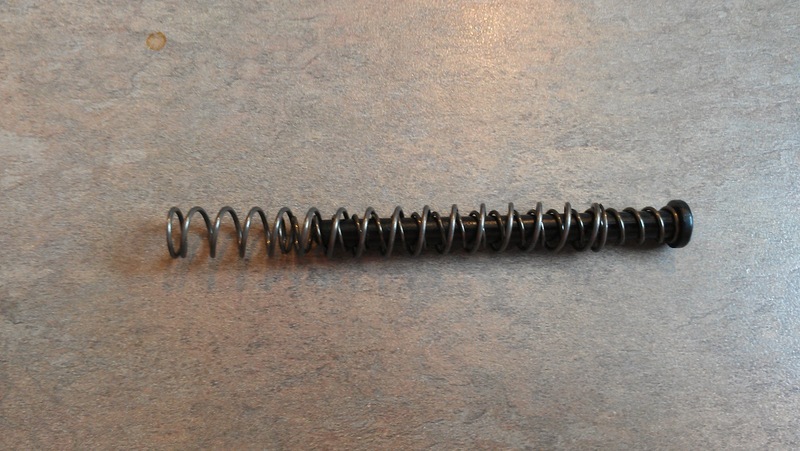 Since this review was written, Ruger has expanded the line to include a Striker fired model and one they call a "Pro". The triggers are much improved and some models come from the factory with laser installed. I still own this firearm and use it classes monthly. If you're considering a smaller sized single stack 9mm you could do far worse than this gun and pay more.